THP is giving the world a FIRST LOOK at the new hybrid coming out from Cleveland Golf in 2011 by the name of the Mashie. These pictures are in hand pictures and have never been seen before this. This hybrid was the biggest hit at the 2010 THP Golf Outing & Demo Day and people have continued to rave about it for the last month. Now we can show off what people have been talking about. Everything about this club screams throwback. From the retro finish on the crown to the chrome underneath with the rails on the sole. Cleveland even went with a throwback headcover to finish off the surprise. Cleveland Golf has partnered with Miyazaki to offer an authentic Tour/Aftermarket C. Kua series shaft as the standard offering in the Mashie series. Miyazaki sets the bar for cutting-edge shaft technology and manufacturing precision, delivering premium performance consistency while maintaining ultralite weight. I will leave that to those that had a chance to test it out at the THP Demo Day and their feedback. Click the link right below this and see Hi-Res pictures (larger) and tons of feedback from everybody in attendance at the outing. Feedback & more pictures are available by clicking the link below. You can also follow along as 5 consumers got the chance to do long term testing on the Cleveland Mashie. Here are their reports (updated daily). Solid club all around!! One of my favorites from the Outing Demo Day. The Miyazaki shaft is money. no doubt about it, this was the one club that just blew folks away. it was a lot of fun watching everyone’s reactions not only after they hit the club for the first time, but when they picked it up. everythng about this hybrid screams awesome to me! i love the throwback look of the head and the headcover, then throw a miyazaki in it…..BOOM!!!! i want to hit one in a bad way. 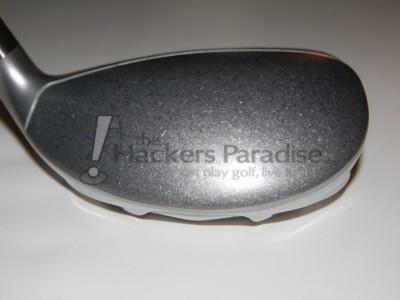 Loved everything about this club from the THP Demo day! Great shaft and a great looking head with great performance. Agree with everyone here. This club is easy to hit, long and straight. Pretty much everything I want in a hybrid. I love this club! Must have it now! I would love to demo a mashie. I live in Pittsford NY 14534 home of Oak Hill (many national tournaments) and Locust Hill (home of the LPGA Wegmans major). My handicap is 25 but once in a while I break 90. Shot a 99 on the Oak Hill West course in October. PS: I will keep the mashie under my bed (don’t tell my wife). Thanks. I would like to purchase a mashie demo club sight unseen!!!!!!!!!!! They did it again. All golfers, no matter the handicap, gotta’ love this design.